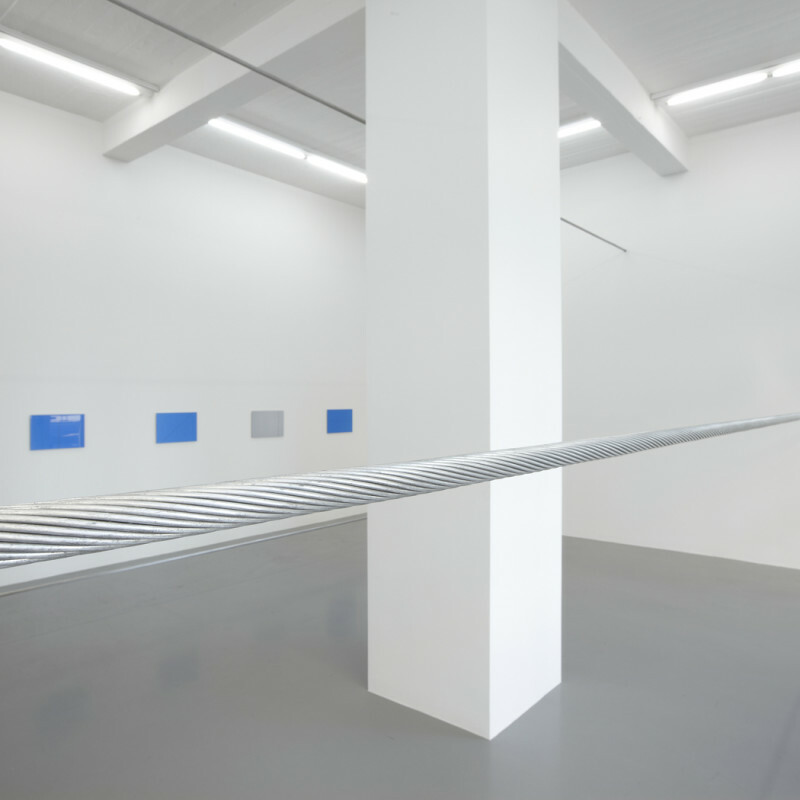 The exhibition consists of an installation of conductor cables along with five photographs of the same cables in situ against the backdrop of the blue sky. Three power lines stretched between the gallery walls at different heights make it a challenge for the audience to manoeuvre around the space. The cables are made of spirals of aluminium threads, 24.4 mm in diameter, which in their usual application within Iceland’s electricity network transmit power from hydroelectric and geothermal power plants carrying a current of 141 MW. In Power Lines Valgardsson continues his investigation into the materiality of art and his interrogation of ready-made materials. Here the artist presents his viewers with a medium that is familiar to nearly everyone, but at a different scale: generally we see these cables at a distance as part of the landscape, not up close as we see them here. Throughout his career, Valgardsson has used other custom-made DIY materials to produce works of a transient nature. In particular, he has explored the conceptual properties of paint as part of his research into the relationship between nature and the man-made environment, for instance, likening a stream of paint to a stream of water. Thus the power cables are part of Valgardsson ongoing interest in currents, both in the physical and the metaphysical sense. Valgardsson scrutinises the aesthetics of the quotidian and as he has pointed out, power lines are an ordinary part of our environment: “They are just there.” Unlike the simple building materials and paint he has chosen for previous works, the power line is a phenomenon that is much more loaded, criticised itself as a blot on the landscape and as a symbol of a contested infrastructure. In this exhibition, Valgardsson strips the cables of their specialized function and uses them to create a three-dimensional drawing within the space of the white cube, thereby placing this industrial material into an aesthetic context. The photographs of the cables against the sky are monochromes with a single line running through them. Like Barnett Newman “zips”, they are typical of Valgardsson’s way of seeing beauty in unexpected places—the sublime is here and now. In addition to the work in the main gallery, Valgardsson has made a limited-edition photographic print for the show entitled Straumur (e. Current). In the photograph a hand touches river water, the same source of the electricity conducted by the power lines. Ívar Valgardsson (b. 1954) lives and works in Reykjavík, Iceland. He studied at the Icelandic College of Art and Crafts in Reykjavík and the Stichting de Vrije Academie voor Beeldende kunsten in The Hague. Solo exhibitions include shows at ASÍ Art Museum, Reykjavík (2009); Kópavogur Art Museum, Gerdasafn (2000); and Reykjavík Art Museum – Kjarvalsstadir (1991).